expressed as the rebound number. specifically with type N, although many of the comments are universal. can be read through a window in the side of the casing. preparation of the concrete surface. be sent back to the manufacturer for re calibration. instrument. Any surface water should be wiped from the concrete. be taken in exactly the same spot. still in the test position. encompass the likely range of strengths in the structure. the rebound number (R) where the instrument is not used on a vertical surface. rebound number and the concrete strength measured on recovered cores. dispersion obtained from the graph. 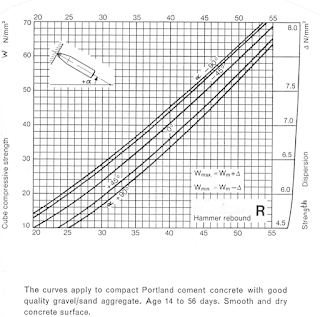 The top of a concrete pour is not representative of the concrete quality. faces or on the soffit of the structure. Analyze equipment performance records to determine the need for repair or replacement. Confer with network users about how to solve existing system problems. Coordinate with vendors and with Purchasing Department to facilitate purchases.